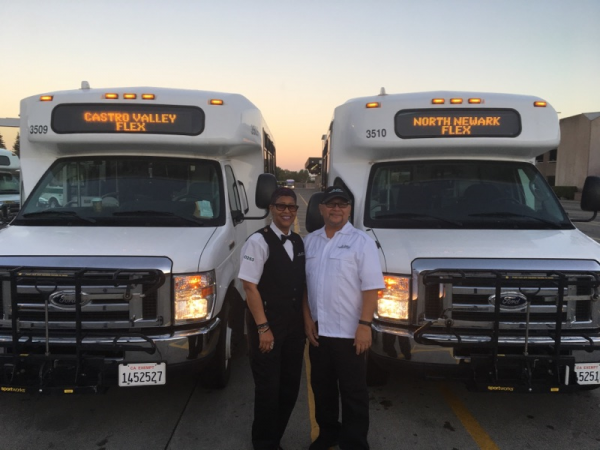 AC Transit’s new Flex service is making it easier for customers in Newark and Castro Valley to get to and from their destinations. One call or one click will take you to and from any bus stop within the service zone, on demand. Monday – Friday, 6 a.m. – 8 p.m., excluding holidays. The cost to ride Flex is the same as any other AC Transit local service. Discounted Clipper fares and day passes apply. Newark: ( OPEN A MAP ) Flex will connect stops in the area of what is now Line 275 in Newark upon request. Castro Valley: (OPEN A MAP) Flex will connect stops in the area of what is now the northern portion of Line 48 in Castro Valley including new service along Redwood Road between Somerset Avenue and Castro Valley BART as well as Redwood Road between Seven Hills and the Aitken Community and Senior Center upon request. HOW DO I USE FLEX? You don’t have to stand and wait for Flex; Flex will come when you schedule it. And scheduling is easy. You’ll be asked to create an account using an email address or a telephone number so we can confirm your reservation and let you know when your bus is on its way. Call (510) 891-5470 to schedule a ride. We recommend you book trips 30 minutes before you want to depart. You can even book recurring trips up to three months in advance. This makes your daily commute so much easier. Just remember to cancel if you find you won’t be using the service on any given day. You can also book the same trip for members of your family or other traveling companions at the same time. Simply enter the number of passengers traveling together. REMINDER: If you choose to call (510) 891-5470 for help from customer service, keep in mind that they are available Monday through Friday, 6 a.m. to 7 p.m.; Saturday and Sunday, 9 a.m. to 5 p.m. Closed major holidays except Presidents Day, MLK and Veterans Day. 1. Book a trip. Connect from your smartphone, tablet or computer anytime. Or, call (510) 891-5470 to reserve your ride. Customer service agents are available to assist you Monday – Friday, 6 a.m. – 7 p.m. or Saturday – Sunday, 9 a.m. – 5 p.m. except holidays. 2. Catch the bus. Arrive at your chosen bus stop by the scheduled time. If you want, we’ll notify you by text or email when the bus is 10 minutes away. 3. Enjoy your ride. Don’t forget to book your next trip. WHERE DOES MY BUS PICK ME UP AND DROP ME OFF? Newark:( OPEN A MAP ) Pick up and drop off locations are at selected bus stops within the service zone, including the Union City BART station. The stops will be clearly marked with the Flex logo. Look for the bus that is marked with the Flex logo and a lighted sign that says Newark Flex. Newark Flex departs Union City every hour at the :10 and the :40 minute mark. Castro Valley:( OPEN A MAP ) Pick up and drop off locations are at selected bus stops within the service zone, including the Castro Valley BART station. The stops will be clearly marked with the Flex logo. You can catch a Flex bus at Castro Valley BART every HOUR on the :30 minute mark. DO I ALWAYS NEED TO MAKE A RESERVATION? Reservations are required. However, you can board a Flex bus without a reservation at one of the BART stations within the service area. Newark: You can board a Flex bus at Union City BART every 30 minutes without making a reservation. Just tell the operator where in the service zone you need to go. Newark Flex departs Union City every hour at the :10 and the :40 minute mark. Castro Valley: You can catch a Flex bus at Castro Valley BART every HOUR on the :30 minute mark. HOW DO I KNOW WHEN MY BUS WILL PICK ME UP? You will be asked to select your departure or arrival time when you book your trip. The contact information you provide allows us to confirm your trip via email, and also allows us to notify you via text or email when your bus is ten minutes away. It’s important to remember that the Flex bus will not pick you up unless you have reserved your ride. The only place you can catch Flex without a reservation is at BART stations. WHAT IF I NEED A MOBILITY DEVICE, OR IF I NEED EXTRA TIME TO BOARD? All Flex vehicles are fully accessible to mobility devices. You can let us know you use a mobility device when planning the trip. This means no guess work and that your needs are factored into your trip.